When I compiled my list of 100 Vietnamese Foods to Try, even though I listed #28 Bo Tai Chanh (Vietnamese Beef Carpaccio with Lemon), I realized I hadn't eaten this in a really long time. Luckily, my youngest aunt was awesome enough to give me a hunk of filet mignon. Oh. My. God. It was so incredibly tender. I cut it up into smaller steaks and lil' sis and I savored it over the course of several days. I saved one small portion in order to make bo tai chanh. You don't have to use filet mignon, a good sirloin or eye round will work as well. 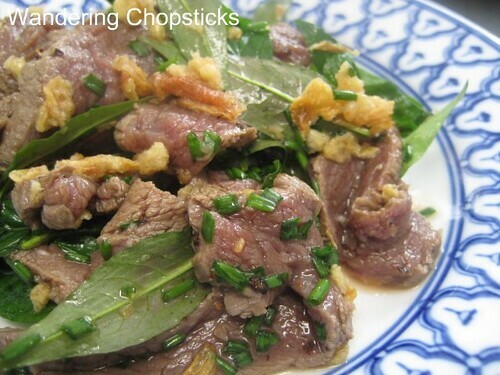 Typically, the beef is completely raw, then marinated in lemon juices in order to "cook" it. I decided to quickly sear mine, just enough to brown the outside, while keeping the inside still raw. 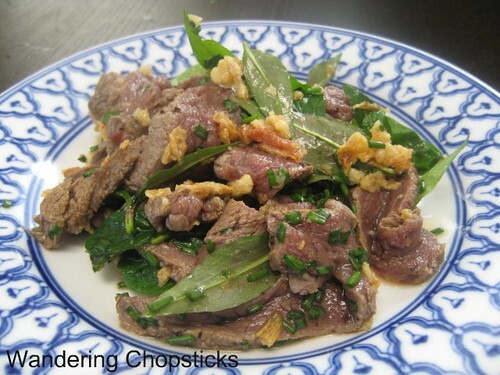 After the beef is "cooked" to your liking, it's tossed with herbs and Hanh Phi (Vietnamese Fried Shallots). I added just a bit of orange juice to tone down the sourness of the lemons in the marinade. Why? Because it's Weekend Wokking time again! When Marija of Palachinka, host of the mushroom round-up, chose the ORANGE as this month's secret ingredient, I wanted to challenge myself to think of something beyond juice or dessert. So even though you can't see the oranges in this recipe, it does lend a slight sweetness and flavor to the beef. About 1/2 cup chopped herbs of your choice. I used rau ram (Vietnamese coriander), chives, and mint. Thai basil and cilantro would work too. Optional: 1/2 Orange, juiced or 1 chili pepper, chopped. Wash and clean the beef. If you don't plan to sear it, then cover the beef and place it in the freezer for 15 minutes. You don't want to freeze the beef, just stiffen it enough so that it's easier for slicing thinly. If you do plan to sear the beef, heat a pan on high until it is very hot. Drizzle a bit of oil and quickly sear the beef. It's OK if it's not uniformly browned. You want just enough for color without cooking it through. Then remove the beef from the pan and let it rest. In a shallow bowl, squeeze 2 lemons and 1/2 orange. Add 2 tsp fish sauce. Slice the filet mignon, sirloin, or eye of round beef as thinly as possible. Make sure you're slicing against the grain so that the beef is easier to chew. Add the beef to the lemon/orange/fish sauce mixture and let it "cook" for about 10 to 15 minutes. Meanwhile, prepare the fried shallots and wash and pluck your choice of herbs. You can leave the leaves whole, or chop them up. When the beef is "cooked" to your liking, drain any excess marinade juices. Add the herbs and fried shallots and toss. Serve as a salad or with rice. I'm submitting this recipe to Weekend Wokking, a world-wide food blogging event created by Wandering Chopsticks to celebrate the multiple ways we can cook one ingredient. This month's secret ingredient is the ORANGE. The hosts for February are JS and TS of Eating Club Vancouver. Check out the orange round-up for 10 sweet and savory recipes. If you'd like to participate or to see the secret ingredient, check who's hosting next month. There's an opening for May, so if you've participated in the past and would like to host, please email me. 1 year ago today, durian - the king of fruits. 2 years ago today, juicy, crispy chicken and Belgian waffles at Merritt Bakery and Restaurant - Oakland. Very orange-licious Weekend Wokking entry! I need to get me some Vietnamese beef carpaccio now WC. You always make me hungry, even if I just ate! Wow, this looks so flavorful! I see you put lots of herbs and flavorings. The orange juice is a good idea. Definitely would add a new dimension of flavor and sweetness into the dish! I'm sure the herbs added the fragrance, the orange added the sweetness and the lemon added the zing! Good carpaccio!!! Carpaccio with a hint of orange? Hmmm...that is interesting. I do like your mystery ingredient. Glad it worked out well in the weekend Wokking series. It looked delicious, I want some now!!!! Ohhh looks delicious! Like a ceviche but with beef. I love the combo of beef with citrus and fish sauce and can just imagine how good it would taste. another helpful tip: i usually ask the butcher to cut my eye of round super thin, like paper thin and they usually do a great job with it, same way i get my pho just right. so i'm a little scared of this dish. don't get me wrong, it looks wonderful and when i order my pho or steak, i like my beef medium rare etc. but i don't know if i could consume beef prepared this way. i think i've had this dish before, but with fish, which i'm ok with. Just plain lemon juice is great too, I was eeking out another twist so I could do something for WW. At least you tried! I appreciate the effort. Especially when you're still recovering from your wisdom teeth surgery. Thanks. I bet your beef and orange stir-fry was great too. You just want someone else to feed you! Great tip. I thought I included that in the recipe, but I guess not! Yeah, you can just buy pre-sliced eye of round for pho. That's why I seared my beef first. So really, it's more like very rare steak. You can let it cook longer if you're too afraid of eating raw beef. Delicious. Searing is a nice touch. Ok, I'm hungry again. Random questions but do you know of a good place to order Nem Nuong thats really good? (the whole actually patty to bring home to cook). Both Nem Nuong Ninh Hoa and Nem Nuong Khanh Hoa offer it to-go too.